Rockman Corner: New Rockman Goods: Figures, Busters, Keychains! New Rockman Goods: Figures, Busters, Keychains! Big Bad Toystore are loading up on a batch of unannounced Rockman goods, imported straight from Japan. Among items listed, 20cm Rockman prize figures (pictured), a six piece keychain set, and a set of two plush Busters (Rock Buster and Proto Buster). The figures will ship in October, while the keychains and Busters are expected in November. Hit the links above to preorder! Thanks for the tip, ProtomanX! Shoulders aside, somehow, it's better than Capcom America's statue. Yay! More merchandise! Who cares about video games? Right? Well, I agree with anon 1. It's not too shabby, but the D-arts and Kotobukiya figures are still the best. While no new games shows up, will hear some Rockman music. I knew all that moe crap would ruin the Japanese' sense of anatomy sooner or later. The head and the buster are way too small. And he's got kind of a reverse jazz hand thing going. I guess poor Rock was a victim of Dr. Wily's latest creation: "Witch Doctor Man"! $50 for the deuce? Sweeten the deal please. Dunno what to think, really. Figures look a bit dis-proportioned. Certainly not as good as the US statue. The keychains are kinda cool, but I would have preferred different art from each respective cute little game charm. Looks unbalanced as is. Lastly, are the plush busters the same that we've seen from Japan, or does this make three known Mega Buster plushes and two for Blues? I'm sure those limited gold figures will be highly sought after soon enough. those look awesome. as for the people who thinks they don't look proportionate, check out the official megaman artwork from megaman 7.
the proportions seem to be based off of the artwork from megaman 7 when megaman was drawn taller. 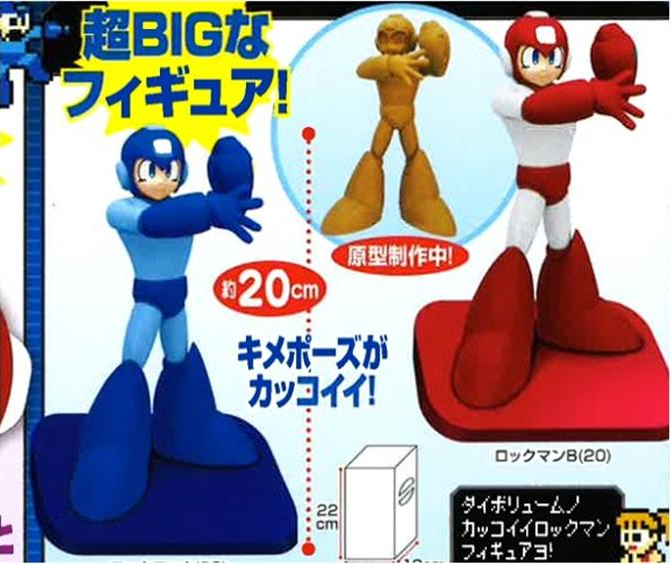 there were also some figures released during the time megaman 8 was out that have similar proportions. megaman wasn't always drawn to look short, the taller proportions were used from 95 until around 98-99 when rockman and forte was released. The goat can hear, see, and run. I think it's the torso that makes Rock look off. I have the D-Arts Classic figure on my desk, and after a quick comparison between it and the photos of the statue above, and I can definitely say that the torso is a bit too wide. the figure kinda looks to have the same proportions as megaman did during the anime cutscenes in megaman 8.